Many professional athletes from MMA fighters, NFL players and NBA sportsmen to world class boxers and MLB stars have long been fans of Dynamax. Collaborating with Bellator and former Strikeforce competitor Michael Chandler, we have created a line of medicine balls with the same advanced construction as our Elite range, designed specifically for these professional athletes and aspiring fighters. Dominate the octagon, from daily-to-day training to fight camp preparations, the Elite ‘MMA’ Medicine Ball is designed to be versatile and withstand whatever you throw at it. 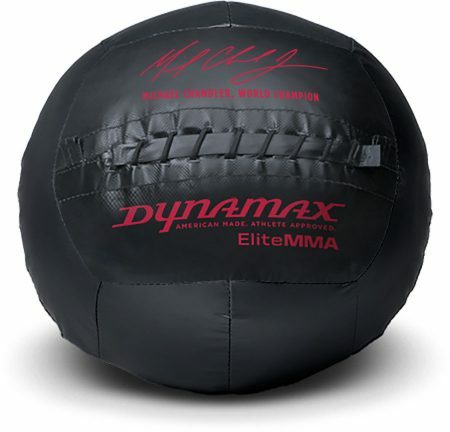 Similar to our Standard Medicine Ball, the Elite ‘MMA’ is 14” in diameter and holds its excellent shape and weight distribution even through intense workouts and training programs. Perfect for high-velocity training, this leather medicine ball, signed with Chandler’s seal of approval, offers exceptional standards when incorporating it into fitness and can be used in a huge range of workouts.